knit and designed on the train – sometimes when i woke up in the middle of the night and couldn’t get back to sleep. to continue the tradition of the smoke ring pattern, ben and i decided that this should be a free pattern too. i like the idea of free patterns for the blog that are specific to time and place. i don’t know the rules, but i don’t think that this hat increases enough to be considered a real tam, but i couldn’t resist the alliteration of the name and it does have many tam-like qualities. – gauge: 4 ½ – 4 ¾ st./in. row 1: *k5, k2tog* – 54 st.
row 2: *k4, k2tog* – 45 st.
row 3: *k3, k2tog* – 36 st.
row 4: *k2, k2tog* – 27 st.
row 5: *k1, k2tog* – 18 st. ENJOY! and go ride a train if you haven’t yet. p.s. 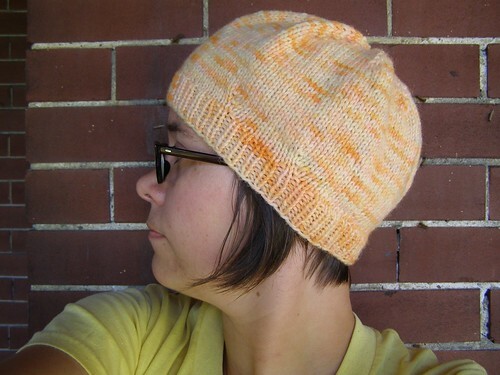 i also added it to ravelry for all you ravelers – although i can’t figure out how to mark it as a free pattern. p.p.s. here’s the size small one i did using donegal tweed that was gifted by my friend laurie on our way through seattle and some mountain colors mill end bought at the dye shop while in mt. sorry for the unmodeled pic, but my head is not size small. Cute!! Thanks for sharing with us! You look like you are enjoying your trip. Are you in Pittsburgh yet? I like the colors and the shape of this. Is this recycled yarn and did you hand dye it? Thanks for the add on ravelry, I just joined a few days ago, and am just about caught up posting every knitted FO that I still have in my possession. On your design details page there’s a spot to mark it as a free pattern over on the right. I love the tam. It’s so cute. Thanks for the free pattern! I’m going to give it a try with some odd ball skeins I’ve got lying around. Fun! Thanks so much! 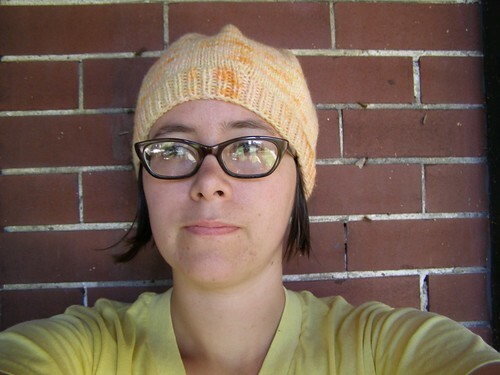 I’ve been stalking your hats on Ravelry all morning. I love them! I love your tam! I basically have to make this now. Awesome pattern…thanks for sharing! 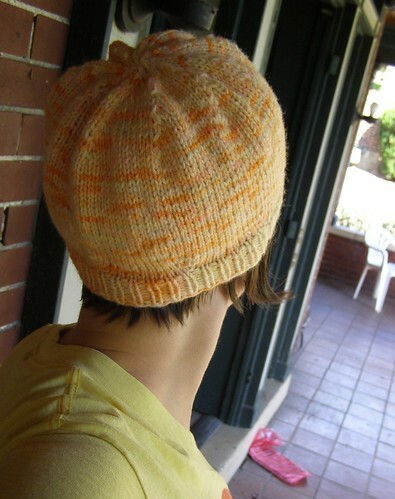 I made this tam for a friend of mine and she loved it. Thanks for a great pattern! Thanks for this pattern!! I made it for my 6 yr old out of some really colorful yarn and added a nice solid colored crocheted flower … it looks sooo cute on her and it fits me too. I just might have to steal it from her. Oh and I’m a novice knitter and found this pattern very easy. Thanks again! Pingback: ok, so i really do knit « floofle! yay! thanks so much for sharing and glad you liked it.